April is upon us here in Pittsburgh and that means getting soaked to the bone by freezing rain and hail. Awesome! But April is also the month of the Spring Classics. Like a lot of bicycle riders I can more easily relate to the demands of a one day race than I can to the 20+ stage-race spectacle of the big tour road races. The ability to go as hard as you can, ignore pain, and embrace suffering, for like 160 miles makes me feel a little guilty for complaining about getting wet on a 20 mile ride. 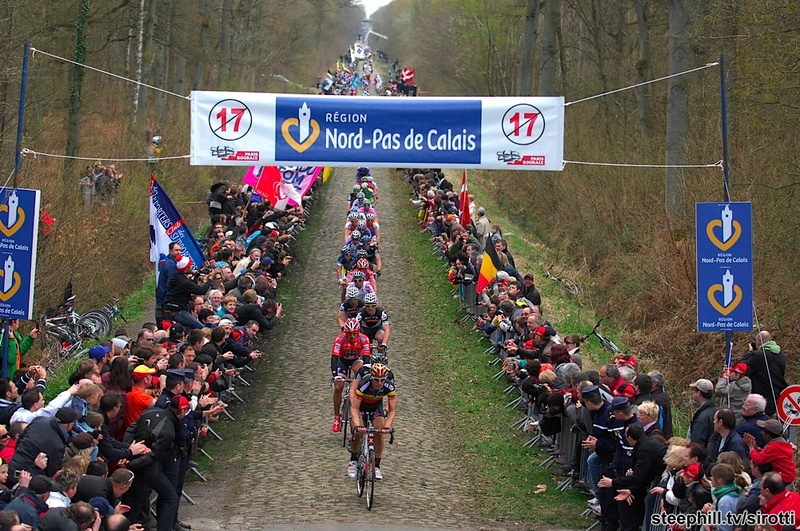 Anyway, if you have some spare time on Sunday morning, check out Paris-Roubaix. Here is a photo from the nasty section of cobbles known as the Arenberg Trench, or the Trouée d’Arenberg for those that speak Spanish or whatever. Image taken from steephill.tv, where you may get to watch a live stream, if you wake up early. Speaking of waking up early, and getting stuff done, some of you may have noticed, after months of research by the Marketing and Partnerships department, Rigid Bicycles has launched a new branding campaign, including new logo and trademark. The logo version that is in the header of today's post preformed well for sample audiences in test markets like Djibouti (and also in the world's smallest island nation, the Republic of Nauru); so I figure that by next week the logo should be as relevant to the national consciousness as the McDonald's golden arches. We'll know more next week. Which, is better than how much we knew last week, when, during my blogular enthusiasm about Pinkbike's move to a print format, I swallowed their April fools joke, hook line and sinker. There are no plans for a Pinkbike magazine, no matter how much time and photoshop skills they put into creating the first issue's cover. Oh well, at least I was not tricked by Stevil Kinevil's April 1st report of abandoning his website for a job at the GAP. Well, its pouring rain outside the window, and I've got places to be. Have a great weekend, and catch you on the flipside.